So it always seems like our farm produces more rocks and boulders than it does crops and livestock! No, actually things grow great here, but when we excavated the land when i was building the house i now have an overwelming stockpile or rocks and boulders. I definately bought a rocky piece of ground. However, instead of letting it get me down, I figured out a way to make the rocks work for me instead of against me. It is still a bit early in the spring (3-11-13) to be planting alot of the herbs yet, but when the weather warms up i will plant all the seeds into the ground and let her grow. I have a fairly large collection of seeds from last spring that i purchased, with ambition of making some kind of herb growing bed. However, every day farm work, kids, and our jobs (wife is a Nurse, i am a Logger), getting an herb bed just never got done. So now, this year the bed is all done, the seeds are waiting, and we will be cooking and BBQ’ing with fresh herbs all summer! Yummy! The bed is placed on a natural ditch and water flowing line (was excavated for water and power lines to the house, so water kinda naturally flows in that area in heavy rains). To avoid over saturation of the soil and herbs, I shallowly dug up any grass in that general area. I then went into the field and packed every single rock by hand over and tossed over the fence landing next to the work area. Once i had a good supply of rocks, I started lining them up and setting them all in place so that they would not only hold in the soil, but also look halfway pleasing to the eye. Once the bed was all shaped i then used a five gallon bucket and a shovel, and placed in Approx. 2 inches of gravel in the bottom of the bed. I did this in thoughts of it will give good drainage for the herbs, but also as a water and drainage barrier for heavy springtime rains and the water that flows underneath the bed. This way the water should have a place to still flow, but not flood out my herb garden, making it a big swampy soupy mess. 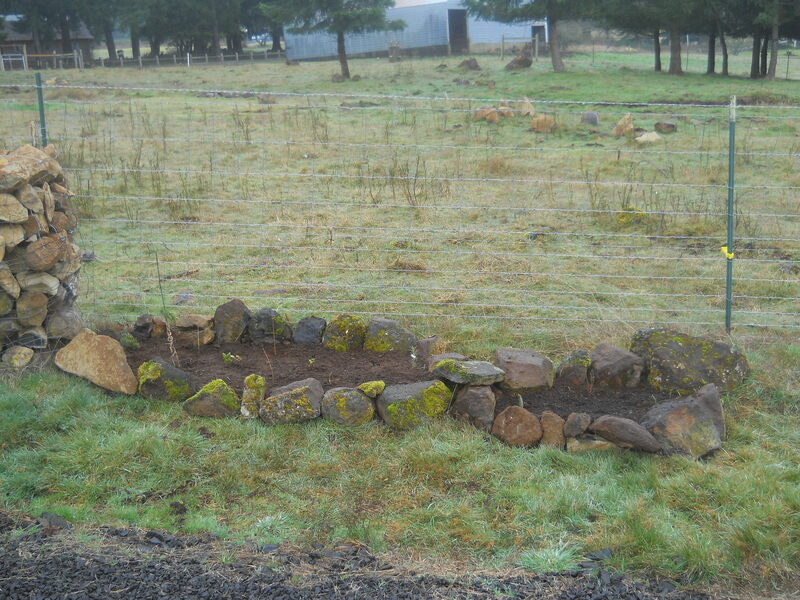 Any ways, once I smoothed all the gravel out i then used the tractor and got some extra soil i have piled up in numerous places around the farm and dumped it into the herb garden, smooting it out and plucking rocks sticks and weeds by hand. then Voila! Rock bed herb garden complete. As far as the herbs i will be planting in there they include: Mint (already planted in there now), Rosemary, Chives, Basil, Horse raddish (have it growing in a pot, need to plant it in my new herb bed), Cilantro/Corriander, Stevia, Dill, Thyme, Terragon, Oregano, Sage, and i am wanting to also pick up some spearmint when ever the local store starts stocking the plants. I was thinking maybe some Lavander also since i know it is edible just to add a little color to the bed, but i may try cooking with it a bit and dabble with it before i plant any. 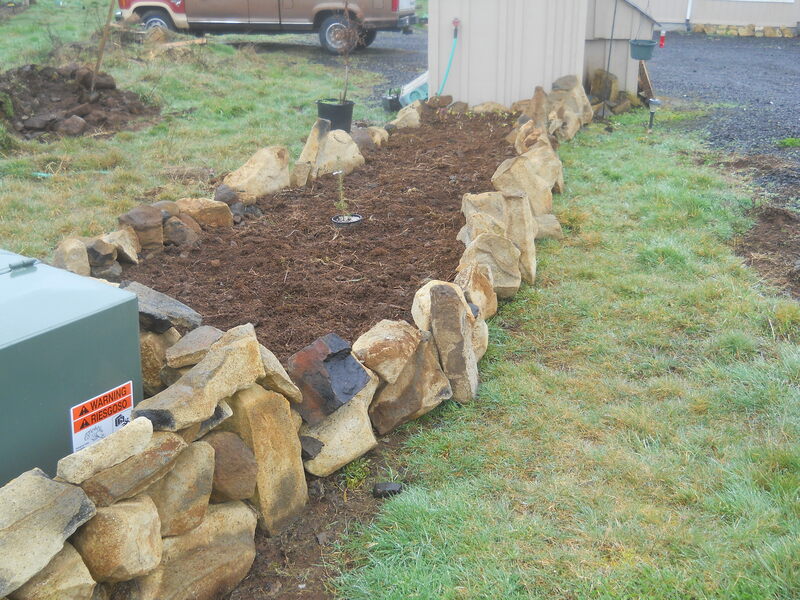 While i was making the rock bed herb garden I also built along side the drive way a rock bed flower and shrub bed. I currently have some small trees in there and some flowers and shrubs, but the trees will be removed and transplanted to a different location once they are bigger and a little more mature and stable. I am using it for kind of an incubation/baby nursing bed for the young trees, giving them a place for them to grow a bit, establish a good root system, get used to the soil, etc. The trees that are there now but will be removed in a year or two and placed in a final location include: Oriental Spruce, Colorado Blue spruce, Ponderosa Pine, Douglas Fir, White Fir (also known as a Piss Fir), a Willow tree, and a Golden rain tree. As far as decorative things that will stay are Forsynthias and Tulips, and will let the wife add what ever flowers she would like to add color. This smaller rock bed is purely decorative, basically just some eye candy along side the drive way (placed it up against a rock jack i build for the fence) as we/people travel up and down the driveway.